The Durant had been under the open sky the last fifteen years so it was in very bad condition. 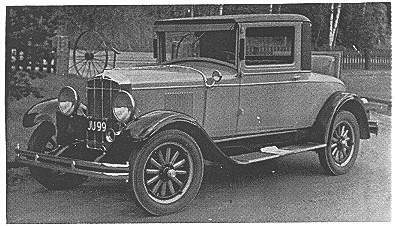 It was used as a pick-up and the rumble seat lid was missing. In addition to that, all the wood was rotten and there was rust on rust, The gas tank was full of water. That wasn't all! A lot of parts were missing including head and cowl lamps, two wheels, vacuum tank, steering wheel, dashboard, bumpers, glass, door handles, radiator cap, hubcaps and rumble seat lid. With all these Darts missing, and much damage to the engine, gear box and differential one would think it could never again be a running car. Before I found my Durant at Al in February 1976 I knew very little about Durant. I had heard the name but knew little else, I received the address of the Durant Owners Club and wrote to them. Some time later I got an answer from the Durant Family Registry, Rnd in November 1976 I obtained membership In the club. I have received a lot of held from the Registry and also from some of the members. The club library provided an indispensable owners manual. Frank Johnson was a great help with Information and John Constenious supplied Headlamps and Bob Abarta had a set of cowl lamps, Jimmy Weaver supplied the windshield rubber. The engine is rebuilt, new pistons and bearings. The frame was straightened and the completed chassis ran for the first time in summer of 77 (see Progress Report Vol. 3 #1 page 13). The body was next, with all wood being replaced, doors and fenders were repaired and all body metal was sandblasted. A new rumble seat lid was made from pictures of another 65 coupe, The car is painted VW Gobi Beige and Black. The interior is beige mohair from Woolies Trim & Accessories in England and the rumble seat was sewn by my wife of leather. New wiring and tires completed the car. Our 1929 Durant has been a lot of work and its obvious that without help from you "over there" it would have been much more difficult to restore our Durant and probably would have taken much longer too.